The Beckman DU 530 is a research grade absorbance spectrophotometer system that is easy to operate. The Spectrophotometer functions with a single cell module, which supports a bunch of alternative cell holders like the 16 mm test tube, 1 cm standard, 10cm rectangular turbidity, and 50uL microcell. The single cell cuvette holder of this Spectrophotometer is the typical starting configuration. The Beckman DU530 has a fixed wavelength mode and scanning mode. It also has time-based kinetics and single component analysis, as well as protein analysis. The Beckman DU 530 Spectrophotometer also includes nucleic acid analysis with DNA/RNA/Oligo Quantitation and purity checks. The cell module is 1cm and wavelength range is 190-1100 nm. The Beckman DU 530 UV-VIS also has 100 user data store and serial RS-232/Parallel port. The Software is also Multi Language. Beckman is a reliable company and has many dependable products for any lab and is a leading provider in the Spectrophotometer industry. The sleek design of the Beckman DU530 makes it an attractive addition to any laboratory competing for lab bench space. 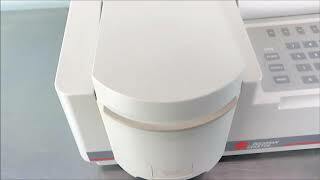 This spectrophotometer can fit small spaces and due to its light weight, can be stored away until needed. The Beckman DU 530 is a top choice amonst Universities and research labs across the nation and can easily be yours for a fraction of the cost. This used lab equipment listing is for a Beckman DU530 Spectrophotometer. The instrument is in excellent condition and has been tested to meet the factory specifications. This Spectrophotometer is currently ready to be shipped and our turnaround time from receipt of order is three business days. If you have any questions about this listing, or any of our other used laboratory equipment listing please give The Lab World Group a call at 617-999-5746.